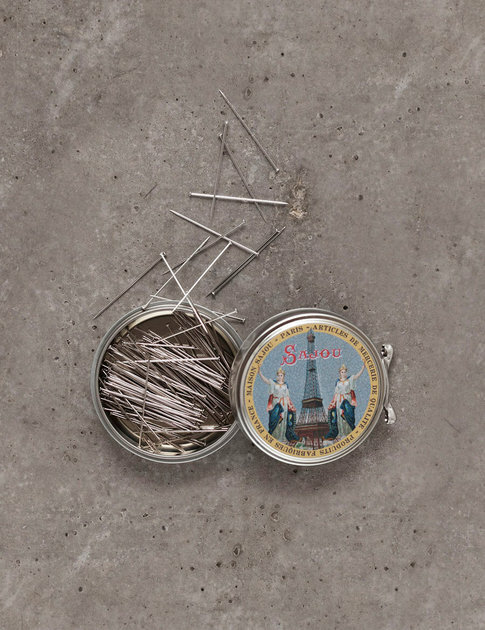 This beautiful little round metal tin from Sajou is containing roughly 120 fine n°5 classic dressmakers pins. Their diametre is 0.70 mm for a length of 32 mm - highly recommended for light fabrics. The box is covered with a round label representing "French genius, enlightening the world", in front of the Eiffel Tower. When you no longer want the needles in the tin, it goes just as well to fill with ex. paper clip, tablets or hair band. It is too beautiful to be hidden in a drawer! Dimensions of the box: diametre 4.7cm - thickness: 1.8cm. It opens by a small key on the side, just like a tin of shoe polish. All our pins and needles are made in France.